If you missed Part 1 of this series, I went over the basics of how to change your model’s style. This post goes a little deeper, showing a few dos and don’ts. It’s rather fun to open SketchUp‘s Styles window and try out everything you see, to play with different face colors, backgrounds, watermarks, background images, etc. But after you try them all out, here are some tips on how the pros use styles. These styles, which have their own collection in the Styles window, are neat to explore. Simply pick one from the list and it’ll be applied to the model, giving it the appearance of chalk lines, or charcoal, pencil, various types of markers and pens, scribbled lines, etc. But everything in life has a price – using sketchy edges can affect model performance. 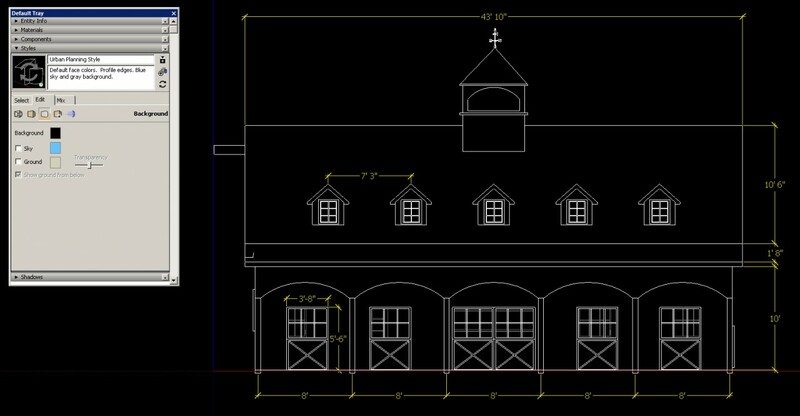 SketchUp has to work a lot harder to constantly redraw chalk or marker lines, as opposed to basic (boring) thin edges. Which segues nicely into the next topic …. You can make things move a lot more quickly when you learn to switch back and forth between styles. Use simple ones while working, use the sexier ones when exporting images. 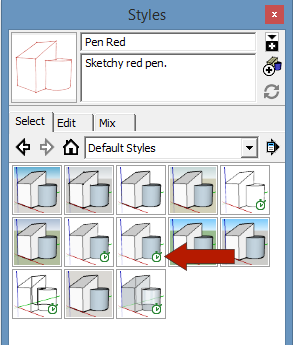 SketchUp makes it easy to tell which styles are “fast styles.” The little clock icon that appears on certain styles means they’re fast: simple edges, no background, no watermarks, etc. When you get really good, you can save templates that have your favorite styles all ready to go, for easy style-switching. Look for this in a future post. A model that has just the right composition of edges will yield the nicest results. Think of this as you would with a hand drawing: every pencil stroke makes a difference. So be deliberate with your use of edges. You can hide edges by pressing the Shift key while using the Eraser. Or you can soften edges (smooth faces on either side of an edge) by using Ctrl or Option with the Eraser. 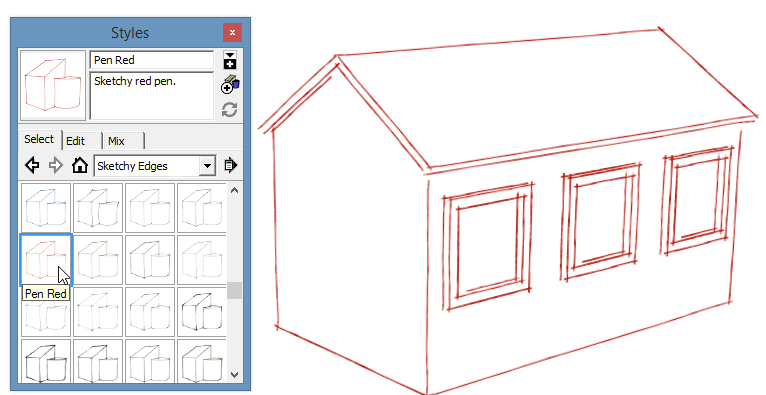 If you’re even mildly interested in SketchUp styles, James Hannigan’s SketchUpArtists is a site you need to bookmark right now. They have dozens of professionally-designed, free presentation styles for download. If that’s not enough, they also post invaluable tutorials on rendering and presentation. Images, materials, and textures that use bright, crisp, high-res graphics will look weird when your model style displays faces as a bit blurry or faded. You can edit and adjust textures to make quick NPR (non-photorealistic) styles. Here are a few styles I like to use, all of which are cobbled together from the styles that already come with SketchUp. I’ll explain how to make them. From the Styles window, open the “Style Builder Competition Winners” collection and apply “Light Grey Freestyle.” This alone is a great way to get a loosely hand-drawn look. To make changes to this style, open the Mix tab. From the bottom pane, open the “Default Styles” collection and click the “Shaded” style thumbnail. Then click Face Settings, and now the faces from the “Shaded” style are applied to “Light Grey Freestyle,” adding some color. Muted textures work best with this style. You can mix and match different styles using this options. For another change, open the Edit tab and choose the Edge settings. Sliding the bar for “Level of Detail” adjusts the number of edges that appear when you zoom in and out. 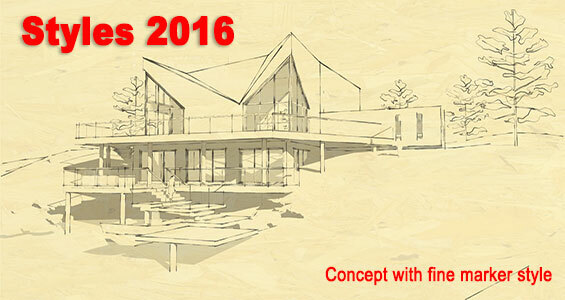 Here’s a nice way to give your model the look of a traditional, black and white CAD drawing. Apply one of the styles in the “Default Styles” collection. Edit the edges of this style. Make the edges 100% white. Make sure that no option is selected other than Edges. Open the Background settings and make sure the Sky is turned off. If it isn’t already, make the background color 100% black. From the Styles toolbar, or the View / Face Style menu, turn on Hidden Line. Turn on shadows (View / Shadows) and open the Shadows window. Adjust the Light and Dark settings to create some deeper contrast. I like the Light slider all the way to the right, and the Dark slider about 3/4 to the left. Daniel Tal, ASLA, is a professional speaker and a registered landscape architect with over 17 years of experience. He is a 3D modeling and visualization expert, has authored two books with Wiley and Sons: SketchUp for Site Design and Rendering in SketchUp and is the tech-editor at large for Landscape Architecture Magazine. Tal runs a 3D modeling and visualization studio for Stanley Consultants, a 1,000 person multi-disciplinary engineering firm. Read more about Daniel.